Book Two of Jennifer A. Nielsen’s The Traitor’s Game series is packed with treachery, and everyone is a suspect or shares some blame. 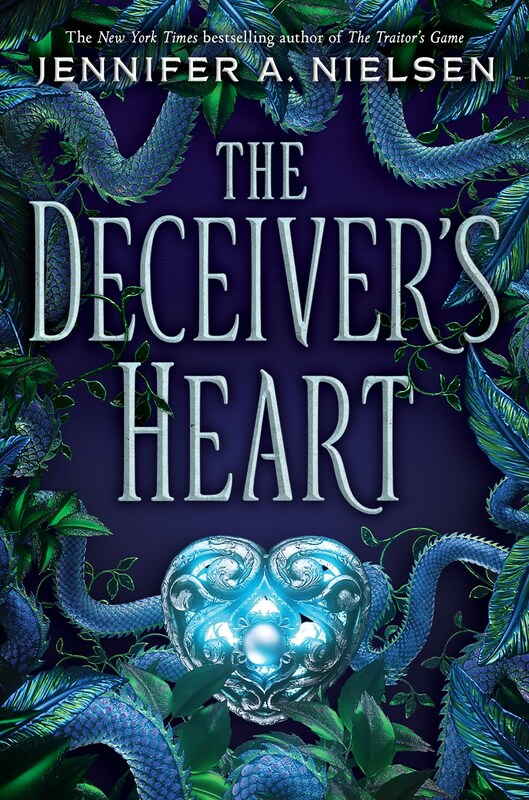 The Deceiver’s Heart opens with sixteen-year-old Kestra Dallisar in possession of the Olden Blade, a dagger capable of destroying the evil magician and tyrant Lord Endrick if it is wielded by the Infidante. When the girl who would save Antora fails in her attempt and Endrick steals her memories and turns her into an IronHeart to spy for him, Kestra changes dramatically. 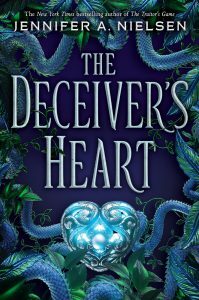 As a weapon of the Dominion, Kestra thinks an arranged marriage to Basil will be far worse than anything else Endrick can do to her, but she soon discovers how wrong she is. Half Halderian and half Endrean, Kestra shares the same blood as Lord Endrick, but so far she has no magic of her own, and she’s not sure she wants it, for fear that it will corrupt her and that she will become as dangerous as Endrick. With her memories altered, Simon Hatch, the finder of the Olden Blade and a member of the Coracks, who are leading the rebellion, must help her remember what she has forgotten—that she is a stubborn, curious, and passionate young woman who acts with intensity and selflessness and wishes to take down Endrick, the man who would crush anything or anyone who will not follow his commands. Although Kestra is Simon’s reason for being, terrible things happen to people connected to Kestra. And because she can’t trust her memories, she is not sure whom to trust and how to proceed. Intent on pushing for a happy ending while being fearful it will never happen, Kestra often feels like a pawn in a game where the odds are stacked against her. She also realizes that often the truth doesn’t matter since people will believe what they want and declare that the truth. So, maybe she’ll get magic, maybe she will get her memories back, and perhaps she and Simon can find a way to undo Endrick’s grip on Kestra’s heart and mind. But the price they will pay is high. One of the most intriguing elements of Nielsen’s novel is its exploration of the subject of magic. In this aspect, it reminds me of Patricia Wrede’s fantasy novel Thirteenth Child, where magic takes on a profound metaphoric meaning. Several times in Nielsen’s book, magic aligns itself with knowledge, experience, and talent since magic empowers performance, providing access to the resources required to complete a task. The word Brillians, a race of people from Brill, sounds punily close to brilliance, and the Brillians are highly intelligent and possess hearing and eyesight that exceed that of most Antorans. Furthermore, the Brillians imitate Endrick’s magic in their technologies and weapons. While Simon is distrustful of magic, believing that “magic sells itself as a solution to problems [but then] becomes a parasite feeding on its host until every trace of good is gone” (150), Kestra believes magic can transform both her and the world. As the plot unfolds, Kestra learns that magic is mostly about seeing. That every perspective offers a way of seeing and that each has an element of truth, but none is the whole truth. She finds magic in her flexibility and in her willingness to learn from different sources, remembering that the truths she sees are as incomplete as her memory. With this parallel, Nielsen seems to be making a point about wisdom and how it depends on the examination of multiple perspectives, on researching different ways of knowing, on accepting that personal understanding and experiences provide only one, limited viewpoint. Furthermore, hope, an irrational but powerful force, can certainly magic us back to mental health and give us the strength to carry on against impossible odds, as it does for Kendra. Just as we kill for the magic of weaponry and technology and power, we might also form an alliance in search of those things. The bottom line is that. like magic, knowledge transforms us; therefore, the only normal state is the state of change. As Kestra unravels life’s conflicts and complexities, she grows more whole as she acquires particles of truth and as she gives part of herself away—validating one of life’s greatest paradoxes. Tagged magic, tyranny. Bookmark the permalink.